CANTON, Mass. (August 14, 2014) – August is National Coffee Month, and Dunkin’ Donuts, America’s all-day, everyday stop for coffee and baked goods, has brewed big news for coffee drinkers, today introducing new Colombian Packaged Coffee, the brand’s first-ever single-origin packaged coffee. Dunkin’ Donuts’ new Colombian Packaged Coffee is a medium roast with a full-bodied flavor and sweet finish, showcasing the balanced and lively characteristics that have made Colombian coffee one of the world’s most popular coffee varieties. Dunkin’ Donuts’ Colombian Packaged Coffee is available in an 8-ounce bag only at participating Dunkin’ Donuts restaurants nationwide for a limited time, while supplies last. Dunkin’ Donuts’ Colombian coffee is registered by the National Federation of Coffee Growers of Colombia, which ensures the coffee is produced to the highest standards. 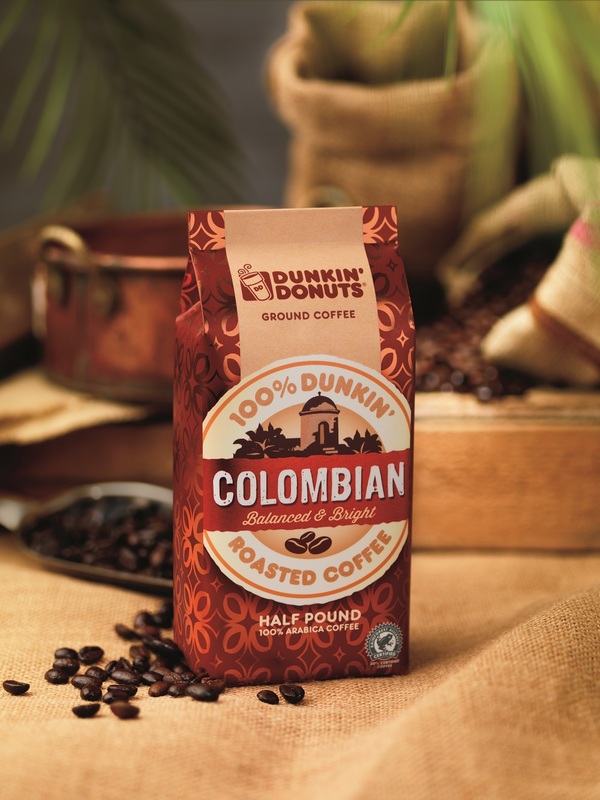 Dunkin’ Donuts’ Colombian Packaged Coffee is also the brand’s first packaged coffee with the Rainforest Alliance Certified™ seal, made with 30% coffee beans sourced from Rainforest Alliance Certified farms. The Rainforest Alliance is an international nonprofit organization that works to conserve biodiversity and ensure sustainable livelihoods. Rainforest Alliance certification helps to protect wildlife; safeguard soils and waterways; and improve quality of life for workers, their families and local communities in order to achieve true, long-term sustainability. This marks the second time Dunkin’ Donuts has introduced a Rainforest Alliance Certified limited time product this year. In April, the brand introduced Iced Green Tea featuring the Rainforest Alliance Certified seal. According to Jeff Miller, Dunkin’ Brands’ Executive Chef and Vice President of Culinary Innovation, the new Colombian Packaged Coffee is an exciting and important introduction for the brand’s guests. “Colombian coffee is one of the most popular varieties in the world, and we are thrilled to expand our coffee portfolio with new Colombian packaged coffee featuring beans sourced from a single place of origin from Rainforest Alliance Certified farms,” he said. Dunkin’ Donuts’ packaged coffee is the perfect way to enjoy the delicious taste of Dunkin’ Donuts coffee at home, any time. Available in favorite flavors such as Original Blend, Dark Roast, Dunkin’ Decaf®, Hazelnut and French Vanilla, Dunkin’ Donuts’ packaged coffee is available at participating Dunkin’ Donuts restaurants in a 16-ounce bag. Earlier this month Dunkin’ Donuts announced additional new menu items to excite coffee lovers. Dunkin’ Donuts’ new French Vanilla and Hazelnut Swirls are a sweeter, creamier take on the brand’s most popular coffee flavors. These rich and creamy flavor swirls offer guests a delicious new way to customize their hot and iced coffee, lattes or Frozen Coffee Coolatta® frozen drinks to create a sweeter, more indulgent beverage. Dunkin’ Donuts also serves coffee drinkers a number of other flavor options, including Caramel and Mocha Swirls, as well as unsweetened and sugar-free flavor shots such as French Vanilla, Hazelnut, Caramel, Coconut, Toasted Almond and more. All Dunkin’ Donuts flavor shots are part of the brand’s DDSMART® menu of better-for-you items.